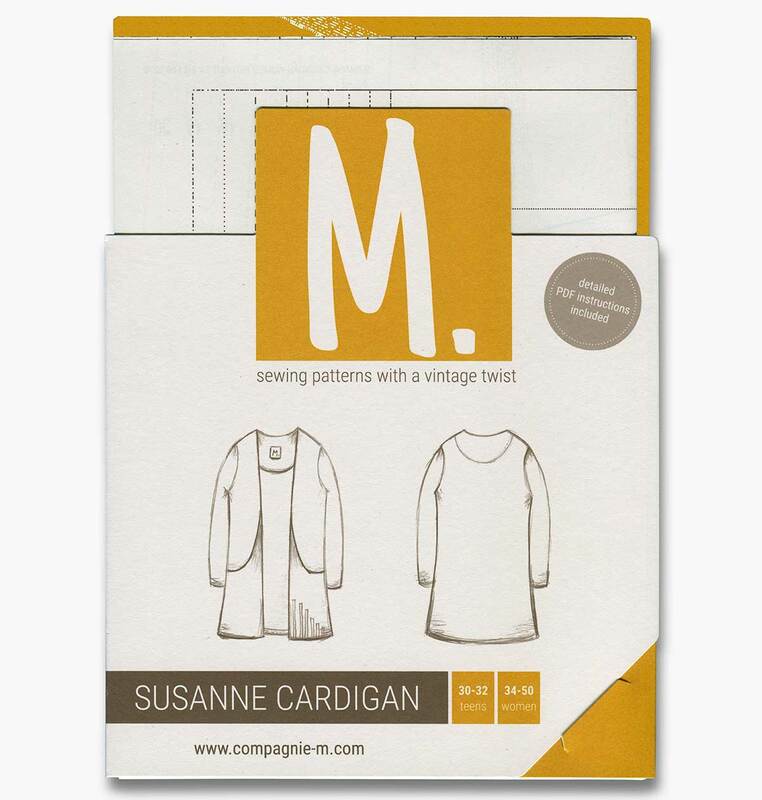 Today, I’d like to give you my review of this Compagnie M. pattern: the Susanne cardigan. I can’t remember exactly how I have discovered Compagnie M., probably through Facebook or Feedly (blog RSS feed reader). When I saw the Susanne cardigan and all the different versions one could make with one single pattern, I was convinced, and I ordered the adult/teen pattern as well as the kid pattern. I have ordered the paper pattern. And I received the pattern paper a few days later through the post, in a neat little (slim) cardboard envelope and was very happy with the packaging straight away: just some cardboard and paper. No plastic wrap to throw away, but good quality eco-friendly materials. I also liked the colour scheme of the packaging. I love this mustard yellow colour! So I quickly opened the cleverly designed pattern cardboard envelope to read through the instructions. But then I was disappointed: no paper instructions! That is my ONLY disappointment, but still I’m quite upset to have to use the digital instructions. Of course I could print them. And once you’ve sewn the pattern it’s quite easy to remember. But still: when I buy a paper pattern, I expect the instruction to come in the package. If in a few years time I want to sew this pattern again, I would appreciate to find the instructions neatly placed next to my paper pattern, in the pretty envelop. I understand that the digital instructions have a lot of pictures (great! ), so a printed version of these would look very bulky. But still, just the text would help, with all the information regarding sizing, amount of fabric needed etc… (and maybe some simple schematics for the tricky steps). I love the design, it’s simple, clever and quick to sew, with lots of ways to personalize your garment to make your very own version. Even the simplest version will look stunning with a good choice of fabric. The pattern comes in two versions: with and without seam allowance. And THAT is clever. Because I HATE having to add my own seam allowance to a pattern. (boring and time consuming). So high five there!! The paper quality is really good. and I’ve not noticed any mistake. I’ve first bought the adult version and quickly bought the kid version too. I have already sewn 3 garments from this pattern!!! I have worn them straight away!